Need help, After installing the Affinity Photo 1.6.0.89 update, with any file I open only 1/2 of the image is displayed. More of it will display for a moment when I adjust the size slider. What is your Windows Display Scale? Is that the full image that's visible in the document? My Windows display is set at 130%, I tried 100% same issue. (Screen res is 2560x1440 on a 32" BenQ monitor). 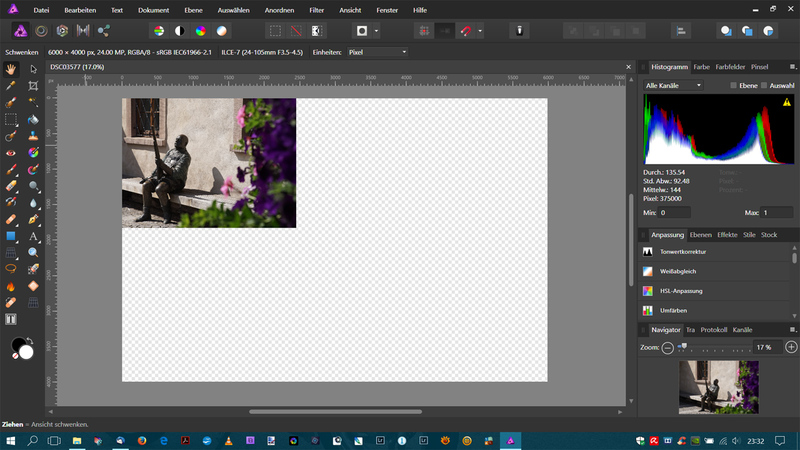 Yes, That is a screen capture of my Affinity Photo showing the issue, your'e seeing what I am. 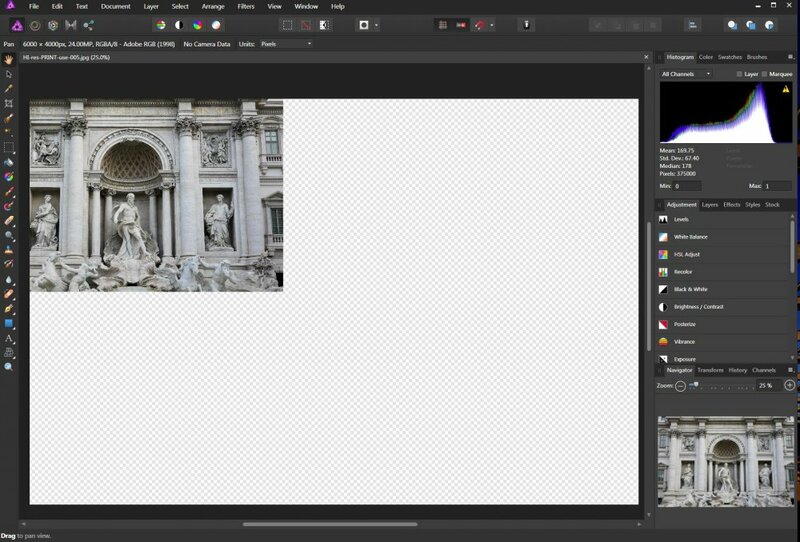 shows for an instant before it goes back to what you see, Using the zoom slider the bottom of the work window will show part of it again just for a second. I will update my 1080P laptop to v1.6 and see if repeats itself. Edited update, V1.6 is OK at 125% scale, when doing a custom scale that's where the problem occurs. Facing the same problem as mentionend above: Images appear in main window at reduced size including background patterns! And whatever step of zoom used, the surronding patterns will not disappear and the zoom step to get the image passed into the window (strg+0) will result as shown in the attached screenshot. The navigator window shows the image completely. AP 1.5.2.69 never showed this, so what to do? In preferences, what is your retina setting? Automatic / Fastest / Highest Quality? thanks, but we`re talking here about bugs on windows, so my problem is related to Win 10 running on Acer-laptop with display in FullHD (1920 x 1080). I doubt that a configuration change of my display will help because all other software (Lightroom, Photoshop, Capture One etc.) and even AP 1.5.2.69 are working perfectly. Just purchased and installed today. Am having the same problems as above. Win 10. All other graphic/photo software is fine. I have followed xleo's advice and in the AF setting "retina rendering": low quality (fastest) registered. The display error was corrected afterwards. a) set the above retina setting back to "automatic (best)". b) In the Windows system settings, set the display size from 130% (user-defined) to 125% (default-option). As a result, the display error has now been corrected. Whether the above-mentioned troubleshooting options for other users is successful, I can not say. Just try it! It seems like there is a bug where the display scale isn't 100%, 125%, 150%, or 200%. I tries a couple of custom settings and the problem repeated. Mark' comment about not being at 100, or 125, 150 or 200% is correct and causes it. My Win10 laptop was set at 150% before installing V1.6 and no problem, my desktop Win7 was at custom 130% and that was a problem, reset it to 125% and all is good. So the default Windows scaling options should not cause any problems. Thanks for the feedback. On Windows 10 (my development machine) you only get the options for those standard scales, so that's why I've missed this. Apologies. I've gotten this logged with development. It is now 3/28/2018 and this problem persists with version 164.4.104. I cannot resolve the issue by setting my display to 100%, or 125%, or 150%. I've also tried changing the retina display option, and the "Renderer" from Intel to Nvidia, to no avail. Affinity needs to fix this issue, as it makes Affinity Photo nearly useless. If you're saying that changing your display scaling to 100%, 125%, or 150% did not fix the problem for you, I think you should provide more details about your display setup (number of monitors, etc.). From what I recall seeing here in the forums those settings have worked for everyone else using a single display. Of course, I may have missed seeing something, or there may be aspects of the problem that I don't understand. But perhaps you're experiencing a different problem, and providing additional details may help the Affinity team understand your issue. anything other than 135% affects other programs I use. The answer to this problem is to FIX it not to suggest workarounds. This is a little tricky to solve but it's a known issue and we are looking into it. Please bear with us while we work on a fix. Thanks for the reply. I would hope that the next software release will address this. I have an HP Pavillion with 24" monitor with an Intel HD Graphics 530 and Nvidia GeForce 930MX. The display is running at 1080p. As I said I've also tried changing the retina display option, and the "Renderer" from Intel to Nvidia, to no avail. Or changing the display to 100 or 125% did not resolve the issue. Actually I have not tried 150% because that is just too large for me. Microsoft don't recommend using a custom scaling. They even provide a warning about it, saying that some text or apps might become unreadable. display properly at 135%. and some don't at 125% These include Photoshop, Lightroom, Corel Painter, Word, Excell and of course Windows 10.